“What should I wear today?”, for some, it’s an easy choice for others not really. But what if I told you that it won’t be a problem anymore? 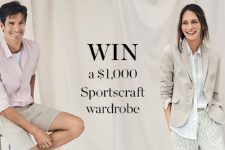 That Style Chick is offering you the chance to win a lifetime styling experience. You get to spend 5 hours with Gabrielle Aitken Gibson, the stylist behind that Style Chick app so you can learn more about your body shape, what colour to choose, basically everything you need to know about what to wear or not! This contest expires on January 31, 2019.